If you’ve spent more than a few minutes reading interior designer blogs and architecture magazines, you’ve probably heard it is perfectly OK to think outside the box, incorporating some structural and decorative elements that you normally wouldn’t see in certain settings. While this is true, when it comes to modifying your home’s exterior appearance, there’s a point that too much personal expression and “unboxed thinking” starts to cause visual chaos and dissonance. Here’s a quick recap of what to expect in the coming weeks from this series. Next week (Week Two): In Colonial Ranch & Other Traditional Homes, we’ll lay out some do’s and don’ts for traditional architecture styles. You’ll learn why it is a bad idea to mix too many replacement window styles together, and why some architects recommend always replacing existing windows with a like style — although that isn’t a hard and fast rule. Week Three: In Craftsman & Bungalow Homes we’ll explain why simplicity is usually the best approach, especially if you want to retain the original appearance and functionality of your home. We’ll discuss some stylistic choices — like the instantly-recognizable divided-light windows with delicate crisscrossed corners — that will always be associated with the Craftsman Era, and modern options that help you enhance energy-efficiency while very closely mimicking the original design. Week Four: Modern & Contemporary Home Styles & Replacement Patio Doors will cover a few different styles of patio doors that complement most homes built post World War II, and how to balance appearance, performance and personal preferences when choosing and designing your rear and side entrance doors. Week Five: Selecting Window Styles Considering Functionality vs Appearancerounds out the series with tips for putting your new knowledge into action. There are times that appearance will trump functionality and vice versa, but most of the time you can have both. 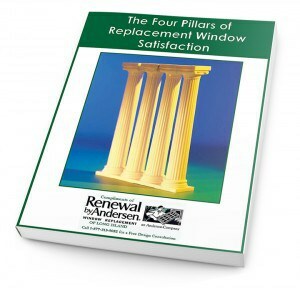 This final series article will explain how to make sure your replacement windows look like they could have been part of the original construction while also improving comfort, safety and energy-efficiency. What Else Does This Series Offer? Throughout the series you’ll find helpful information that informs better design decisions. You’ll learn a bit about different window styles — casements, awnings, vertical and horizontal sliders — and when they first appeared or gained popularity in the United States. And, you’ll learn why embellishments, such as grille patterns and patterned glass, enhance certain architecture styles while they fight against the natural character in others. We hope this series helps our New Jersey and metropolitan New York neighbors explore replacement window and patio door solutions that complement their homes rather than contradict the architectural style. As you read through each weekly post, keep a pencil and a pad (or your digital note-taking device) handy so you can jot down any questions you have for our team. When replacing existing home windows makes sense, and honestly, sometimes it doesn’t, you’ll be more satisfied with the outcome when you spend time exploring various styles and accessories. We invite you to fill in the short form on this page or call 1-888-826-2451 to schedule a private, no-obligation home consultation to learn more about our full line of home improvement products today.